A strong finish from Guiseley Vixens was not enough to prevent a 2-1 loss to second-placed Sunderland in the FAWPL North. 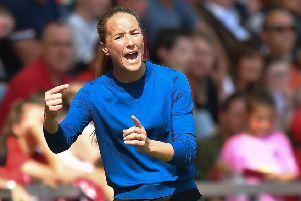 A sending off and a Monika Stube strike saw Guiseley halve their 2-0 deficit with under 20 minutes to go, but ultimately they fell short, with the Vixens now having two weeks to regroup for a mouth-watering affair with Huddersfield Town. It was a fairly steady afternoon for Brighouse Athletic in their 2-0 win at Chorley Town. Lavinia Nkomo and Charlotte Proud both netted for Town, whose fading promotion hopes officially ended after Burnley were confirmed FAWPL North Division One champions. Leeds, meanwhile, kept up their solid end to the league season, with Rebecca Hunt scoring in a 1-0 win at Newcastle to make three successive league clean sheet. A huge title clash in the West Riding Premier Division saw league leaders Hepworth United just edge second-placed Yorkshire Amateur 2-1 to stay top with just one game remaining. Michelle Walsh scored for Ammers who now sit eight points behind with two games in hand. Meanwhile, Middleton Athletic kicked on from their stunning victory over Hepworth last week by winning 5-2 at Bradford Park Avenue after Natalie Bell and Kirsty Russell had put Avenue 2-1 up. A late equaliser saw Brighouse Athletic having to settle for a 2-2 draw with Tingley Athletic despite taking the lead twice through Sandra Bates and Demi Topliss. Yet another huge title clash saw Thackley go top of the First Division after beating title rivals Ripon City 2-1. Goals from Megan Butterworth and Abbie Thompson saw Thackley overcome Lousie Wilson’s strike to make it nine wins on the bounce for the league leaders. Dewsbury Rangers grabbed their first victory since November, winning 3-2 against Ilkley who scored through Sophie Dale and Hannah Spivey, while Skipton Town won 3-0 at Boroughbridge. The Second Division saw champions Farsley Celtic Juniors finish the season the way they started, steamrollering Thackley Reserves 10-0 to finish the season with maximum points. In the Supplementary Cup Ossett United Reserves picked up another draw in Group B, with Jodei Clarkson scoring in a 1-1 stalemate with Wetherby Athletic. Meanwhile, Leeds United Development remain second in the group after drawing 2-2 with Lower Hopton through Molly Bridon and Katie Breckin, while Sildsen began with a dominant 4-0 win at Pontefract Sport and Social.